June 20, 2012 Pilar B. During the first four weeks of his life, Zachary slept in a travel bassinet on the floor next to our bed (our bed is very low to the ground so this worked well for us). 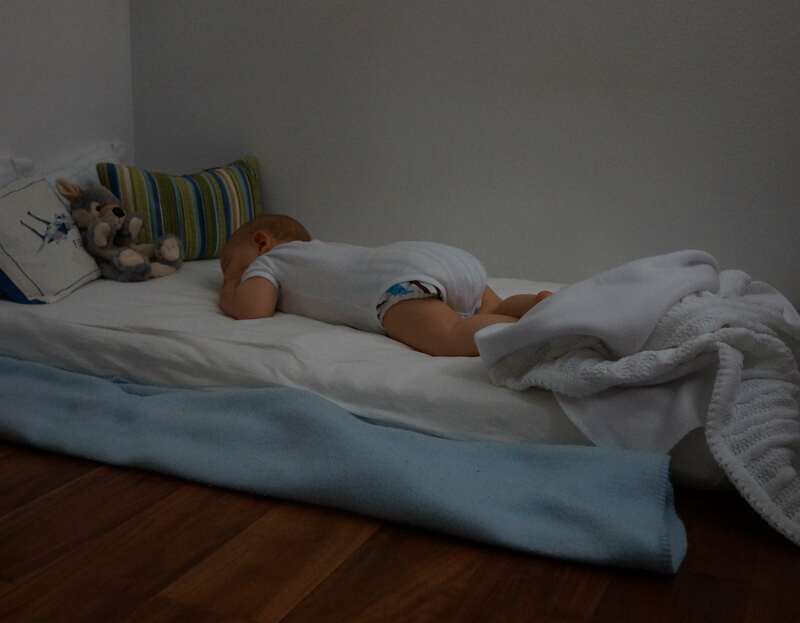 It was comfortable for him to have his own space in which to move and stretch out (yes, newborns move) and yet it was next to our bed so I could nurse him as soon as he requested it and he could hear our breathing. Our mattress is a “full”, we’re tall people, and we’re on a budget, so bed-sharing was out of the question. I would bring him into our bed around 5am and he’d nurse and doze, but he was never really comfortable there and would not sleep for long periods of time. I think it just felt too big for him, since he couldn’t touch the perimeter! He was always in my arms or in the Moby wrap when he was awake, and as a newborn I would wait until he fell asleep before transferring him to the bassinet. I made a special pad for the bassinet (a lot thicker than the one with which it came) and also used the topponcino on top of that mattress, so Zach was pretty high up and could get a good view of his surroundings. The sides of the bassinet were mesh, so it helped him to not feel caged in. In “Understanding the Human Being”, Dr. Montanaro notes that it’s important for babies to have “sufficient space for unhindered vision and movement”, so our bassinet fit the bill. 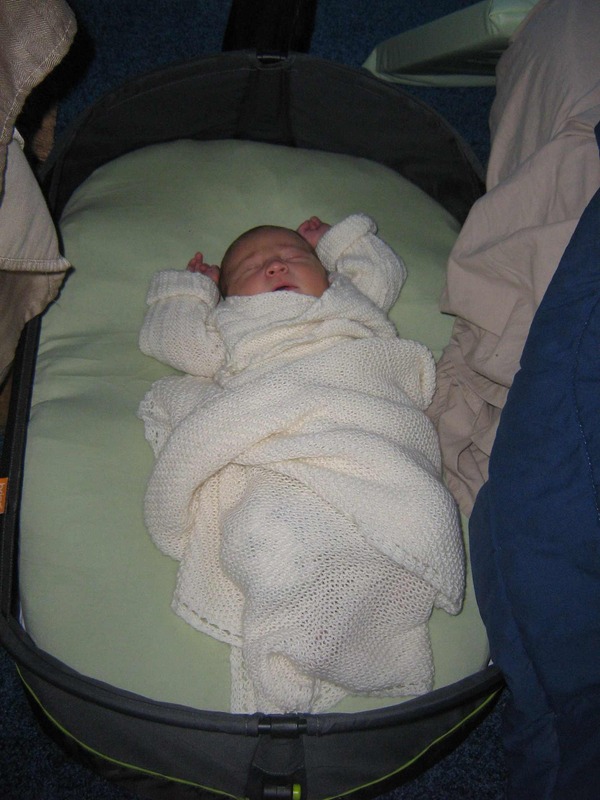 Zach, as a newborn, in his bassinet (this was before I started using the topponcino and laying him down on his side). Zach had a strong startle reflex, and he would wake himself up often. I don’t believe in traditional tight swaddling, so what I did was use a blanket to wrap Zach and the topponcino into a loose “burrito”, tucking the blanket under the bassinet pad. He had freedom to move arms and legs, but he felt snuggly and secure and would sleep well like this. When Zach was 4 weeks old, I moved his bassinet to his own bedroom (which is next to ours) and put it on top of his floor bed. This is where he started napping during the day. 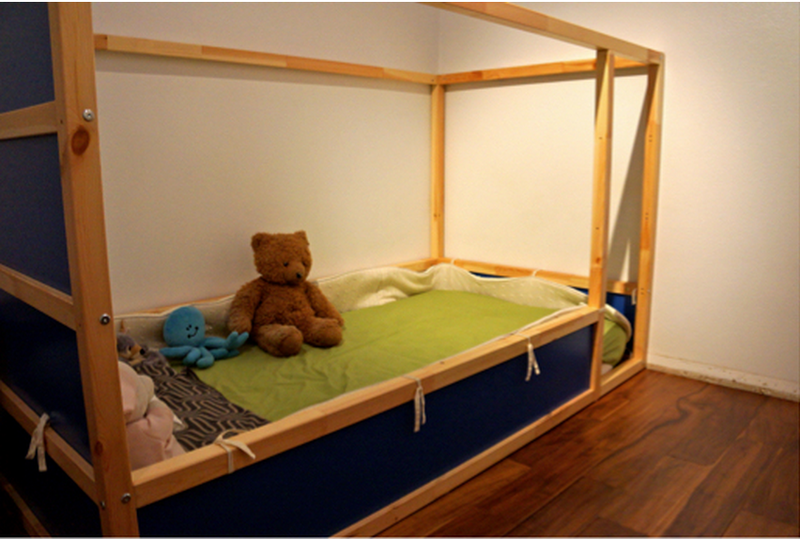 At night I would move the bassinet back to our bedroom. I did this for about one week to get Zach used to the new noises, smells, and lighting of his own room. Since he was sleeping well, I moved the bassinet there permanently and he started sleeping in his own room at night. Whenever he would wake up (about every 3 hours) I would go to his room, nurse him there, and put him back down in the bassinet. Yes, it was rough at first to be completely awakened, but in the long run it will help him understand that he has his own bedroom, and it will avoid the drama of him wanting to sleep in our bed and us wanting him to go back to his. 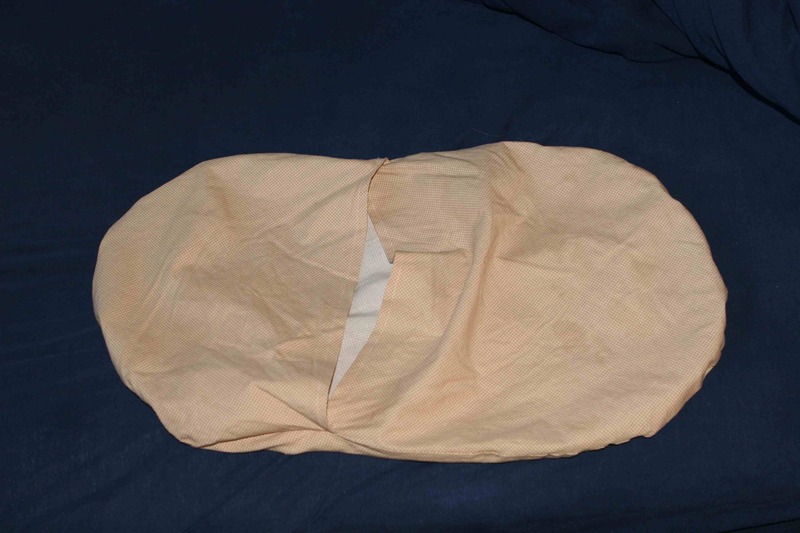 After three or so weeks, I took out the pad that I had made for the bassinet and placed it on his floor bed. By this point he had grown almost too big for the bassinet! I started laying him down on the pad (still using the topponcino), wrapping the whole thing in the blanket, burrito-style. This went on for about 4 more weeks. At one point I tried removing the pad and laying him down on the floor bed mattress, but since he sleeps on his side he still needed the additional support of the pad (he would roll over onto his back and wake himself up). After a few weeks he became stronger, was able to remain in a side-lying position at will, and was then able to sleep on his mattress without the pad or the topponcino (good thing, too, since he was getting too big for the pad!!). His startle reflex dissipated around that time, too, so that helped a lot. 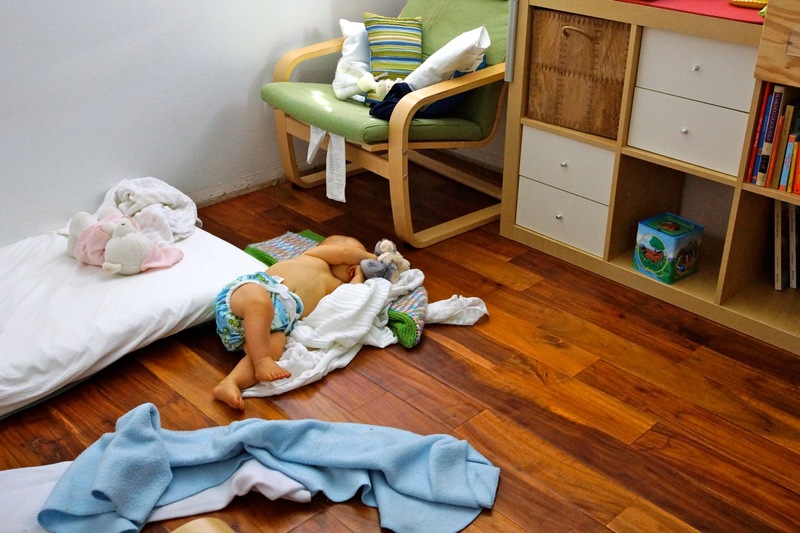 The floor bed has been wonderful… He has lots of freedom of movement; sometimes we’ll find him lying sideways on the mattress or he’ll call for us to come help him because he’s rolled himself off the mattress and onto the floor! He NEVER cries when I lay him down in his bed, and I’m sure that when he starts crawling he’ll continue to enjoy the freedom that comes with not being caged up in a crib. My husband and I enjoy having our bedroom to ourselves, and having separate bedrooms has allowed everyone to sleep better because we don’t wake up with every little peep he makes, and he rests well in his own space. He’s able to sleep through the night now (at almost 5 months of age), but some nights he wakes up either because he’s lost his covers, has a wet or soiled diaper, or wants some help falling back asleep. I take care of whatever is bothering him, pat his bottom a few times, and he drifts off to sleep again. February 23, 2012 February 23, 2012 Pilar B.
I’m very much a “fly by the seat of your pants” type of sewer, so I unfortunately don’t have a pattern or very precise measurements for the topponcino. However, I can share with you how I made it and you can check out the pictures of my topponcino, in case you want to make your own. Cut out two ellipses from the muslin, about 30 inches long by 15 inches wide (leave 1/4″ seam allowance). Place right sides together and sew along the edge of the ellipse, leaving about 12″ open (so you can insert the batting). Turn the sewn pieces inside out so the right sides are showing. Place the muslin ellipse on top of several layers of batting (3-4 layers, depending on the thickness of the batting and on how thick you want your topponcino to be). Trace the elliptical shape on the batting and then cut an ellipse from the layers of batting. Insert these layers of batting into the muslin ellipse, making sure that they don’t bunch up. The topponcino. Note the embroidery thread fasteners. 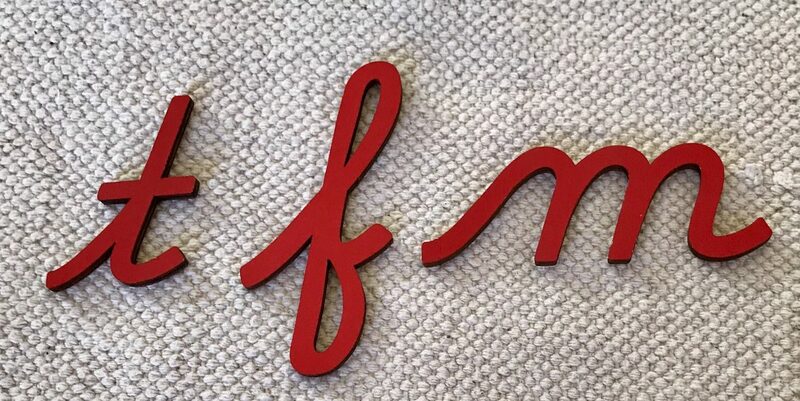 Using embroidery thread, sew through the muslin and batting at several points on the surface of the ellipse so that the batting stays in place. Then sew the open gap in the muslin. Now you have a topponcino. 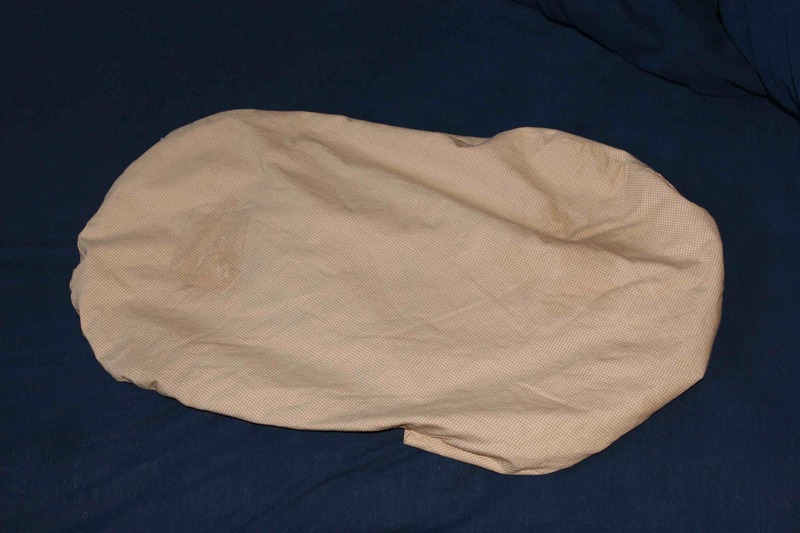 To make the topponcino cover (like a pillow case), place your topponcino on your cotton fabric and trace the ellipse, leaving a 1″ seam allowance. This will be the top of the topponcino cover. To make the underside of the cover, repeat the process of tracing on the cotton fabric but this time make the resulting elliptical shape about 4-5″ longer than the previous ellipse (so you can have an open seam from which to remove the topponcino). Cut this longer piece in half and hem the straight edges. Match up the top and underside of the cover, with right sides facing each other. Sew all around the ellipse (note: the two underside pieces will overlap a little bit). Turn the cover inside-out and iron. This is the underside of the cover. Insert the topponcino in the cover and you’re done! I suggest you make 2-3 covers, especially if your little one is prone to spitting up. Happy sewing, and let me know if you have any questions! February 16, 2012 February 10, 2019 Pilar B.
I have three close friends who have completed the Assistants to Infancy training course (to support the development of children from birth through age 3). When they found out I was pregnant, all three told me to make a topponcino. A toppon-WHAT?! 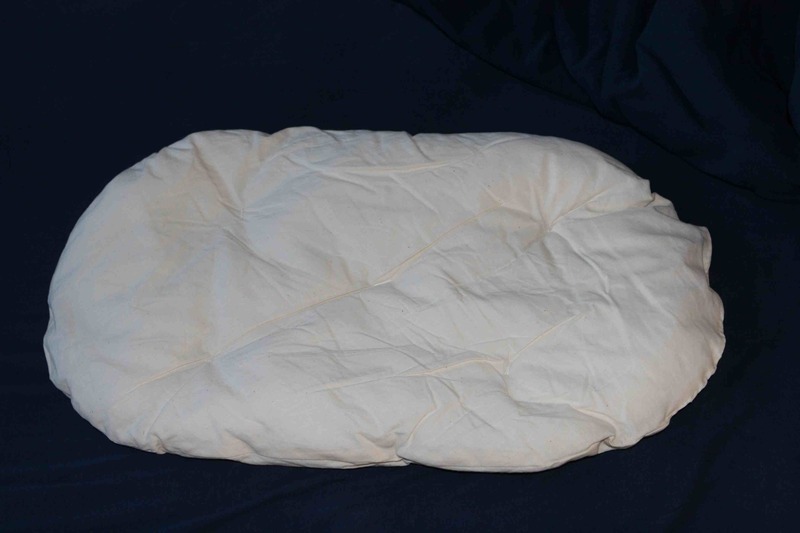 A topponcino is a thin full-body infant pillow that provides the newborn with a sense of security when being passed from one person to another or when being placed onto his bed when he falls asleep in arms. I went ahead and made it anyways (save your sanity and get yours here*)… But then I put it in the back of the baby’s closet and promptly forgot about it. The baby was born, and as most parents of newborns will tell you, my life was turned upside-down. I went into survival mode, trying to figure out what my baby needed and how to best satisfy those needs. For four weeks I struggled with his naps; he’d fall asleep without any problems in my arms after breastfeeding, but whenever I placed him in his bassinet he would quickly stir and begin to cry. One month after his birth, after countless infuriating cycles of “nurse, burp, sleep, put in bassinet, wake up & cry, repeat, tear my hair out”, I remembered the topponcino in the back of the baby’s closet, and my friends’ suggestion to use it when transferring the baby to his bed. I placed my screaming over-tired infant on the topponcino, offered the breast, and watched him soothe and fall asleep. I lowered him down to his bassinet on the topponcino, then very slowly and gently removed my hands from beneath it, and held my breath in anticipation of a meltdown. Nothing happened. Baby slept. And slept and slept! And guess who’s sleeping as well?! I’ve since used the topponcino with my second child and avo ided many of the sleep issues I faced with my first. 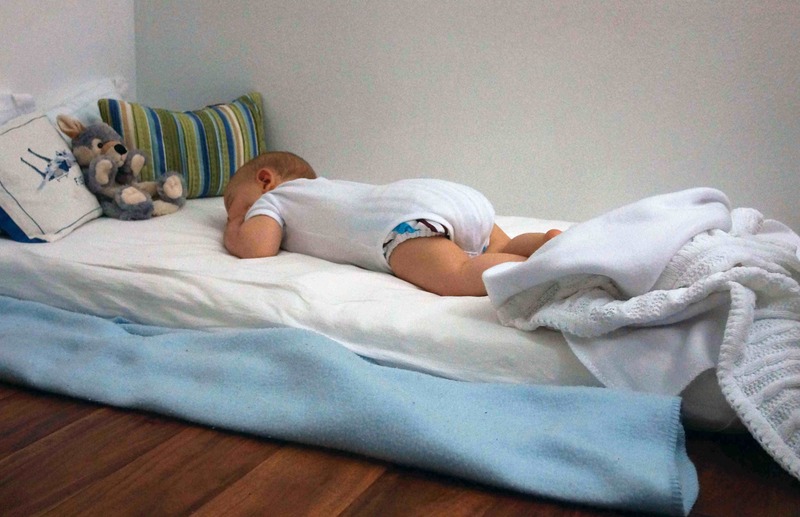 My baby needed to feel the consistency and security of a surface that wouldn’t change temperature, firmness, or smell during those fragile moments of first sleep. The topponcino does this beautifully, and as usual I am humbled by the simplicity and elegance that is Montessori. *This post contains an affiliate link. By purchasing a product through the link, you’re helping to support the Montessori content you love (at no cost to you)! Thank you!